"ARDS" redirects here. For other uses, see ARD (disambiguation). Acute respiratory distress syndrome (ARDS) is a medical condition occurring in critically ill patients characterized by widespread inflammation in the lungs. ARDS is not a particular disease, rather it is a clinical phenotype which may be triggered by various pathologies such as trauma, pneumonia and sepsis. The hallmark of ARDS is diffuse injury to cells which form the alveolar barrier, surfactant dysfunction, activation of the innate immune response, and abnormal coagulation. In effect, ARDS results in impaired gas exchange within the lungs at the level of the microscopic alveoli. The syndrome is associated with a high mortality rate between 20 and 50%. The mortality rate with ARDS varies widely based on severity, the patient's age, and the presence of other underlying medical conditions. Although the terminology of "adult respiratory distress syndrome" has at times been used to differentiate ARDS from "infant respiratory distress syndrome" in neonates, international consensus is that "acute respiratory distress syndrome" is the best moniker because ARDS can affect those of all ages. The signs and symptoms of ARDS often begin within two hours of an inciting event, but can occur after 1–3 days. Signs and symptoms may include shortness of breath, fast breathing, and a low oxygen level in the blood due to abnormal ventilation. Diffuse compromise of the pulmonary system resulting in ARDS generally occurs in the setting of critical illness. ARDS may be seen in the setting of severe pulmonary (pneumonia) or systemic infection (sepsis), following trauma, multiple blood transfusions, severe burns, severe pancreatitis, near-drowning, drug reactions, or inhalation injuries. Some cases of ARDS are linked to large volumes of fluid used during post-trauma resuscitation. Diagnostic criteria for ARDS have evolved over time, in step with an increasing understanding of both the pathophysiology and the limits of diagnostic capability in general practice. The international consensus criteria for ARDS were most recently updated in 2012 and are known as the "Berlin definition". In addition to generally broadening the diagnostic thresholds, other notable changes from the prior 1994 consensus criteria include discouraging the term "acute lung injury," and defining grades of ARDS severity according to degree of hypoxemia (see history). 2 ratio. This degree of PEEP may be delivered noninvasively with CPAP to diagnose mild ARDS. 2 below 100 (generally saturation less than 100%) on a supplemental oxygen fraction of 50% meets criteria for ARDS. This can easily be achieved by high flow oxygen supplementation without ventilatory support. Micrograph of diffuse alveolar damage, the histologic correlate of ARDS. H&E stain. ARDS is a form of noncardiogenic pulmonary edema provoked by an acute injury to the lungs that results in flooding of the lungs' microscopic air sacs responsible for the exchange of gases such as oxygen and carbon dioxide with capillaries in the lungs. Additional common findings in ARDS include partial collapse of the lungs (atelectasis) and low levels of oxygen in the blood (hypoxemia). However, in ARDS, these changes are not due to heart failure. The clinical syndrome is associated with pathological findings including pneumonia, eosinophilic pneumonia, cryptogenic organizing pneumonia, acute fibrinous organizing pneumonia, and diffuse alveolar damage (DAD). Of these, the pathology most commonly associated with ARDS is DAD, which is characterized by a diffuse inflammation of lung tissue. The triggering insult to the tissue usually results in an initial release of chemical signals and other inflammatory mediators secreted by local epithelial and endothelial cells. 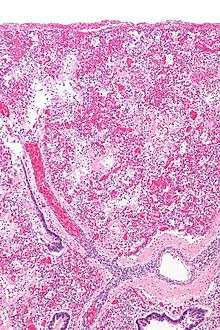 Neutrophils and some T-lymphocytes quickly migrate into the inflamed lung tissue and contribute in the amplification of the phenomenon. Typical histological presentation involves diffuse alveolar damage and hyaline membrane formation in alveolar walls. Although the triggering mechanisms are not completely understood, recent research has examined the role of inflammation and mechanical stress. Inflammation, such as that caused by sepsis, causes endothelial dysfunction, fluid leakage from the capillaries and impaired drainage of fluid from the lungs. Elevated inspired oxygen concentration often becomes necessary at this stage, and may facilitate a 'respiratory burst' in immune cells. In a secondary phase, endothelial dysfunction causes cells and inflammatory exudate to enter the alveoli. This pulmonary edema increases the thickness of the alveolocapillary space, increasing the distance the oxygen must diffuse to reach the blood, which impairs gas exchange leading to hypoxia, increases the work of breathing and eventually induces fibrosis of the airspace. 2 of 60 mmHg (8.0 kPa) despite mechanical ventilation with 100% inspired oxygen. The loss of aeration may follow different patterns depending upon the nature of the underlying disease and other factors. These are usually distributed to the lower lobes of the lungs, in their posterior segments, and they roughly correspond to the initial infected area. In sepsis or trauma-induced ARDS, infiltrates are usually more patchy and diffuse. The posterior and basal segments are always more affected, but the distribution is even less homogeneous. Loss of aeration also causes important changes in lung mechanical properties that are fundamental in the process of inflammation amplification and progression to ARDS in mechanically ventilated patients. Mechanical ventilation is an essential part of the treatment of ARDS. As the loss of aeration and the underlying disease progress, the end tidal volume grows to a level incompatible with life. Thus, mechanical ventilation is initiated to relieve respiratory muscles of their work and to protect the usually obtunded patient's airways. However, mechanical ventilation may constitute a risk factor for the development—or the worsening—of ARDS. Aside from the infectious complications arising from invasive ventilation with tracheal intubation, positive-pressure ventilation directly alters lung mechanics during ARDS. When these techniques are used the result is higher mortality through barotrauma. In 1998, Amato et al. published a paper showing substantial improvement in the outcome of patients ventilated with lower tidal volumes (Vt) (6 mL·kg−1). This result was confirmed in a 2000 study sponsored by the NIH. Both studies were widely criticized for several reasons, and the authors were not the first to experiment with lower-volume ventilation, but they increased the understanding of the relationship between mechanical ventilation and ARDS. This form of stress is thought to be applied by the transpulmonary pressure (gradient) (Pl) generated by the ventilator or, better, its cyclical variations. The better outcome obtained in patients ventilated with lower Vt may be interpreted as a beneficial effect of the lower Pl. The way Pl is applied on alveolar surface determines the shear stress to which lung units are exposed. ARDS is characterized by a usually inhomogeneous reduction of the airspace, and thus by a tendency towards higher Pl at the same Vt, and towards higher stress on less diseased units. The inhomogeneity of alveoli at different stages of disease is further increased by the gravitational gradient to which they are exposed and the different perfusion pressures at which blood flows through them. The different mechanical properties of alveoli in ARDS may be interpreted as having varying time constants—the product of alveolar compliance × resistance.Slow alveoli are said to be "kept open" using PEEP, a feature of modern ventilators which maintains a positive airway pressure throughout the whole respiratory cycle. A higher mean pressure cycle-wide slows the collapse of diseased units, but it has to be weighed against the corresponding elevation in Pl/plateau pressure. Newer ventilatory approaches attempt to maximize mean airway pressure for its ability to "recruit" collapsed lung units while minimizing the shear stress caused by frequent openings and closings of aerated units. Stress Index above 1.1 PEEP was decreased. Alveolar hyperinflation in patients with focal ARDS ventilated with the ARDSnet protocol is attenuated by a physiologic approach to PEEP setting based on the stress index measurement. If the underlying disease or injurious factor is not removed, the quantity of inflammatory mediators released by the lungs in ARDS may result in a systemic inflammatory response syndrome or sepsis if there is lung infection. The evolution towards shock or multiple organ dysfunction syndrome follows paths analogous to the pathophysiology of sepsis. This leads to the impaired oxygenation which is the central problem of ARDS, as well as to respiratory acidosis—which is often caused by ventilation techniques such as permissive hypercapnia, which attempt to limit ventilator-induced lung injury in ARDS. The result is a critical illness in which the 'endothelial disease' of severe sepsis or SIRS is worsened by the pulmonary dysfunction, which further impairs oxygen delivery. Acute respiratory distress syndrome is usually treated with mechanical ventilation in the intensive care unit (ICU). Mechanical ventilation is usually delivered through orotracheal intubation, or by tracheostomy whenever prolonged ventilation (≥2 weeks) is deemed inevitable. The possibilities of non-invasive ventilation are limited to the very early period of the disease or to prevention in individuals with atypical pneumonias, lung contusion, or major surgery patients, who are at risk of developing ARDS. Treatment of the underlying cause is imperative. Appropriate antibiotic therapy must be administered as soon as microbiological culture results are available. Empirical therapy may be appropriate if local microbiological surveillance is efficient. The origin of infection, when surgically treatable, must be operated on. When sepsis is diagnosed, appropriate local protocols should be enacted. Commonly used supportive therapy includes particular techniques of mechanical ventilation and pharmacological agents whose effectiveness with respect to the outcome has not yet been proven. The overall goal is to maintain acceptable gas exchange and to minimize adverse effects in its application. The parameters PEEP (positive end-expiratory pressure, to maintain maximal recruitment of alveolar units), mean airway pressure (to promote recruitment and predictor of hemodynamic effects) and plateau pressure (best predictor of alveolar overdistention) are used. Conventional therapy aimed at tidal volumes (Vt) of 12–15 ml/kg (where the weight is ideal body weight rather than actual weight). Recent studies have shown that high tidal volumes can overstretch alveoli resulting in volutrauma (secondary lung injury). The ARDS Clinical Network, or ARDSNet, completed a trial that showed improved mortality when ventilated with a tidal volume of 6 ml/kg compared to the traditional 12 ml/kg. Low tidal volumes (Vt) may cause hypercapnia and atelectasis because of their inherent tendency to increase physiologic shunt. Physiologic dead space cannot change as it is ventilation without perfusion. A shunt is perfusion without ventilation. 2O was a secondary goal, and subsequent analyses of the data from the ARDSnet trial and other experimental data demonstrate that there appears to be no safe upper limit to plateau pressure; regardless of plateau pressure, patients fare better with low tidal volumes. No particular ventilator mode is known to improve mortality in Acute respiratory distress syndrome (ARDS). Some practitioners favor airway pressure release ventilation when treating ARDS. Well documented advantages to APRV ventilation include: decreased airway pressures, decreased minute ventilation, decreased dead-space ventilation, promotion of spontaneous breathing, almost 24-hour-a-day alveolar recruitment, decreased use of sedation, near elimination of neuromuscular blockade, optimized arterial blood gas results, mechanical restoration of FRC (functional residual capacity), a positive effect on cardiac output (due to the negative inflection from the elevated baseline with each spontaneous breath), increased organ and tissue perfusion and potential for increased urine output secondary to increased kidney perfusion. A patient with ARDS, on average, spends between 8 and 11 days on a mechanical ventilator; APRV may reduce this time significantly and conserve valuable resources. Positive end-expiratory pressure (PEEP) is used in mechanically ventilated patients with ARDS to improve oxygenation. In ARDS, three populations of alveoli can be distinguished. There are normal alveoli which are always inflated and engaging in gas exchange, flooded alveoli which can never, under any ventilatory regime, be used for gas exchange, and atelectatic or partially flooded alveoli that can be "recruited" to participate in gas exchange under certain ventilatory regimens. The recruitable alveoli represent a continuous population, some of which can be recruited with minimal PEEP, and others which can only be recruited with high levels of PEEP. An additional complication is that some alveoli can only be opened with higher airway pressures than are needed to keep them open, hence the justification for maneuvers where PEEP is increased to very high levels for seconds to minutes before dropping the PEEP to a lower level. PEEP can be harmful; high PEEP necessarily increases mean airway pressure and alveolar pressure, which can damage normal alveoli by overdistension resulting in DAD. A compromise between the beneficial and adverse effects of PEEP is inevitable. 2O above the lower inflection point (LIP) in the sigmoidal pressure-volume relationship curve of the lung. Recent research has shown that the LIP-point pressure is no better than any pressure above it, as recruitment of collapsed alveoli—and, more importantly, the overdistension of aerated units—occur throughout the whole inflation. Despite the awkwardness of most procedures used to trace the pressure-volume curve, it is still used by some to define the minimum PEEP to be applied to their patients. Some new ventilators can automatically plot a pressure-volume curve. 2 or peripheral blood oxygen saturation during a step-down trial. Intrinsic PEEP (iPEEP) or auto-PEEP—first described by John Marini of St. Paul Regions Hospital—is a potentially unrecognized contributor to PEEP in patients. When ventilating at high frequencies, its contribution can be substantial, particularly in patients with obstructive lung disease. iPEEP has been measured in very few formal studies on ventilation in ARDS patients, and its contribution is largely unknown. Its measurement is recommended in the treatment of ARDS patients, especially when using high-frequency (oscillatory/jet) ventilation. of lung infiltrates in acute respiratory distress syndrome is non-uniform. Repositioning into the prone position (face down) might improve oxygenation by relieving atelectasis and improving perfusion. If this is done early in the treatment of severe ARDS, it confers a mortality benefit of 26% compared to supine ventilation. Several studies have shown that pulmonary function and outcome are better in patients that lost weight or pulmonary wedge pressure was lowered by diuresis or fluid restriction. An NIH-sponsored multicenter ARDSnet study of corticosteroids that ran from August 1997 to November 2003 titled LaSRS for ARDS demonstrated that despite an improvement in cardiovascular physiology, methylprednisone is not efficacious in treatment for ARDS. Inhaled nitric oxide (NO) potentially acts as selective pulmonary vasodilator which allows for more gas exchange. However, despite evidence of increased oxygenation status, there is no evidence that inhaled nitric oxide decreases morbidity and mortality in ARDS patients. Furthermore, nitric oxide may cause kidney damage and is not recommended as therapy for ARDS regardless of severity. To date, no prospective controlled clinical trial has shown a significant mortality benefit of exogenous surfactant in adult ARDS. Extracorporeal membrane oxygenation (ECMO) is mechanically applied prolonged cardiopulmonary support. There are two types of ECMO: Venovenous which provides respiratory support and venoarterial which provides respiratory and hemodynamic support. Patients with ARDS who do not require cardiac support typically undergo venovenous ECMO. Multiple studies have shown the effectiveness of ECMO in acute respiratory failure. Specifically, the CESAR (Conventional ventilatory support versus Extracorporeal membrane oxygenation for Severe Acute Respiratory failure) trial demonstrated that a group referred to an ECMO center demonstrated significantly increased survival compared to conventional management (63% to 47%). Nutritional: malnutrition (catabolic state), electrolyte deficiency. The annual incidence of ARDS is 13-23 people per 100,000 in the general population. Its incidence in the mechanically ventilated population in intensive care units is much higher. According to Brun-Buisson et al (2004), there is a prevalence of acute lung injury (ALI) of 16.1% percent in ventilated patients admitted for more than 4 hours. Worldwide, severe sepsis is the most common trigger causing ARDS. Other triggers include mechanical ventilation, sepsis, pneumonia, Gilchrist's disease, circulatory shock, aspiration, trauma—especially pulmonary contusion—major surgery, massive blood transfusions, smoke inhalation, drug reaction or overdose, fat emboli and reperfusion pulmonary edema after lung transplantation or pulmonary embolectomy. Pneumonia and sepsis are the most common triggers, and pneumonia is present in up to 60% of patients and may be either causes or complications of ARDS. Alcohol excess appears to increase the risk of ARDS. Diabetes was originally thought to decrease the risk of ARDS, but this has shown to be due to an increase in the risk of pulmonary edema. Elevated abdominal pressure of any cause is also probably a risk factor for the development of ARDS, particularly during mechanical ventilation. The death rate varies from 25–40% in centers using up-to-date ventilatory strategies and up to 58% in all centers. Acute respiratory distress syndrome was first described in 1967 by Ashbaugh et al. Initially there was no clearly established definition, which resulted in controversy regarding the incidence and death of ARDS. In 1988, an expanded definition was proposed, which quantified physiologic respiratory impairment. 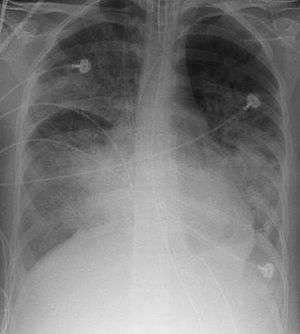 2 ratio less than 300 mmHg with bilateral infiltrates indicates acute lung injury (ALI). Although formally considered different from ARDS, ALI is usually a precursor to ARDS. In 2012, the Berlin Definition of ARDS was devised by the European Society of Intensive Care Medicine, and was endorsed by the American Thoracic Society and the Society of Critical Care Medicine. These recommendations were an effort to both update classification criteria in order to improve clinical usefulness, and to clarify terminology. Notably, the Berlin guidelines discourage the use of the term "acute lung injury" or ALI, as the term was commonly being misused to characterize a less severe degree of lung injury. Instead, the committee proposes a classification of ARDS severity as mild, moderate or severe according to arterial oxygen saturation. The Berlin definitions represent the current international consensus guidelines for both clinical and research classification of ARDS. ↑ Fanelli, Vito; Ranieri, V. Marco (2015-03-01). "Mechanisms and clinical consequences of acute lung injury". Annals of the American Thoracic Society. 12 Suppl 1: S3–8. doi:10.1513/AnnalsATS.201407-340MG. ISSN 2325-6621. PMID 25830831. ↑ Rubenfeld, Gordon D.; Caldwell, Ellen; Peabody, Eve; Weaver, Jim; Martin, Diane P.; Neff, Margaret; Stern, Eric J.; Hudson, Leonard D. (20 October 2005). "Incidence and Outcomes of Acute Lung Injury". New England Journal of Medicine. 353 (16): 1685–1693. doi:10.1056/NEJMoa050333. PMID 16236739. 1 2 3 4 Bernard G, Artigas A, Brigham K, Carlet J, Falke K, Hudson L, Lamy M, Legall J, Morris A, Spragg R (1994). "The American-European Consensus Conference on ARDS. Definitions, mechanisms, relevant outcomes, and clinical trial coordination". Am J Respir Crit Care Med. 149 (3 Pt 1): 818–24. doi:10.1164/ajrccm.149.3.7509706. PMID 7509706. ↑ Bakowitz, Magdalena (August 2012). "Acute lung injury and the acute respiratory distress syndrome in the injured patient". Scandinavian Journal of Trauma, Resuscitation and Emergency Medicine. 20: 54. doi:10.1186/1757-7241-20-54. ↑ Cherkas, David (Nov 2011). "Traumatic Hemorrhagic Shock: Advances In Fluid Management". Emergency Medicine Practice. 13 (11). 1 2 Ranieri VM, Rubenfeld GD, Thompson BT, Ferguson ND, Caldwell E, Fan E, Camporota L, Slutsky AS (Jun 2012). "Acute respiratory distress syndrome: the Berlin Definition. ARDS Definition Task Force". JAMA. 307 (23): 2526–33. doi:10.1001/jama.2012.5669. PMID 22797452. 1 2 3 4 5 6 7 8 9 10 11 12 Irwin RS, Rippe JM (2003). Irwin and Rippe's Intensive Care Medicine (5th ed.). Lippincott Williams & Wilkins. ISBN 0-7817-3548-3. ↑ Volpicelli, Giovanni; Elbarbary, Mahmoud; Blaivas, Michael; Lichtenstein, Daniel A.; Mathis, Gebhard; Kirkpatrick, Andrew W.; Melniker, Lawrence; Gargani, Luna; Noble, Vicki E. (2012-04-01). "International evidence-based recommendations for point-of-care lung ultrasound". Intensive Care Medicine. 38 (4): 577–591. doi:10.1007/s00134-012-2513-4. ISSN 1432-1238. PMID 22392031. ↑ Boyle, AJ; Mac Sweeney, R; McAuley, DF (August 2013). "Pharmacological treatments in ARDS; a state-of-the-art update". BMC Med. 11: 166. doi:10.1186/1741-7015-11-166. PMC 3765621 . PMID 23957905. ↑ Amato M, Barbas C, Medeiros D, Magaldi R, Schettino G, Lorenzi-Filho G, Kairalla R, Deheinzelin D, Munoz C, Oliveira R, Takagaki T, Carvalho C (1998). "Effect of a protective-ventilation strategy on mortality in the acute respiratory distress syndrome". N Engl J Med. 338 (6): 347–54. doi:10.1056/NEJM199802053380602. PMID 9449727. ↑ MacIntyre N (2000). "Mechanical ventilation strategies for lung protection". Semin Respir Crit Care Med. 21 (3): 215–22. doi:10.1055/s-2000-9850. PMID 16088734. ↑ Slutsky AS (May 2005). "Ventilator-induced lung injury: from barotrauma to biotrauma" (PDF). Respir Care. 50 (5): 646–59. PMID 15912625. ↑ Grasso S, Stripoli T, De Michele M, et al. (October 2007). "ARDSnet ventilatory protocol and alveolar hyperinflation: role of positive end-expiratory pressure". Am. J. Respir. Crit. Care Med. 176 (8): 761–7. doi:10.1164/rccm.200702-193OC. PMID 17656676. ↑ Malhotra A (2007). "Low-tidal-volume ventilation in the acute respiratory distress syndrome". N Engl J Med. 357 (11): 1113–20. doi:10.1056/NEJMct074213. PMC 2287190 . PMID 17855672. ↑ Sud S, Friedrich JO, Adhikari NK, et al. (8 Jul 2014). "Effect of prone positioning during mechanical ventilation on mortality among patients with acute respiratory distress syndrome: a systematic review and meta-analysis". CMAJ. 186 (10): E381–90. doi:10.1503/cmaj.140081. PMC 4081236 . PMID 24863923. ↑ Hough, CL (December 2014). "Steroids for acute respiratory distress syndrome?". Clinics in chest medicine. 35 (4): 781–95. doi:10.1016/j.ccm.2014.08.014. PMC 4297198 . PMID 25453425. ↑ Adhikari, NK; Burns, KE; Friedrich, JO; Granton, JT; Cook, DJ; Meade, MO (14 April 2007). "Effect of nitric oxide on oxygenation and mortality in acute lung injury: systematic review and meta-analysis". BMJ (Clinical research ed.). 334 (7597): 779. doi:10.1136/bmj.39139.716794.55. PMC 1852043 . PMID 17383982. ↑ Adhikari, NK; Dellinger, RP; Lundin, S; Payen, D; Vallet, B; Gerlach, H; Park, KJ; Mehta, S; Slutsky, AS; Friedrich, JO (February 2014). "Inhaled nitric oxide does not reduce mortality in patients with acute respiratory distress syndrome regardless of severity: systematic review and meta-analysis". Critical Care Medicine (Systematic Review & Meta-Analysis). 42 (2): 404–12. doi:10.1097/CCM.0b013e3182a27909. PMID 24132038. ↑ Makdisi, G; Wang, IW (July 2015). "Extra Corporeal Membrane Oxygenation (ECMO) review of a lifesaving technology". Journal of thoracic disease. 7 (7): E166–76. doi:10.3978/j.issn.2072-1439.2015.07.17 (inactive 2016-11-26). PMC 4522501 . PMID 26380745. ↑ Hemmila, MR; Rowe, SA; Boules, TN; Miskulin, J; McGillicuddy, JW; Schuerer, DJ; Haft, JW; Swaniker, F; Arbabi, S; Hirschl, RB; Bartlett, RH (October 2004). "Extracorporeal life support for severe acute respiratory distress syndrome in adults.". Annals of Surgery. 240 (4): 595–605; discussion 605–7. doi:10.1097/01.sla.0000141159.90676.2d. PMC 1356461 . PMID 15383787. ↑ Brogan, TV; Thiagarajan, RR; Rycus, PT; Bartlett, RH; Bratton, SL (December 2009). "Extracorporeal membrane oxygenation in adults with severe respiratory failure: a multi-center database.". Intensive Care Medicine. 35 (12): 2105–14. doi:10.1007/s00134-009-1661-7. PMID 19768656. ↑ Peek, GJ; Mugford, M; Tiruvoipati, R; Wilson, A; Allen, E; Thalanany, MM; Hibbert, CL; Truesdale, A; Clemens, F; Cooper, N; Firmin, RK; Elbourne, D; CESAR trial, collaboration (17 October 2009). "Efficacy and economic assessment of conventional ventilatory support versus extracorporeal membrane oxygenation for severe adult respiratory failure (CESAR): a multicentre randomised controlled trial.". Lancet (London, England). 374 (9698): 1351–63. doi:10.1016/S0140-6736(09)61069-2. PMID 19762075. ↑ editors, Fabio Sangalli, Nicolò Patroniti, Antonio Pesenti, (2014). ECMO-- extracorporeal life support in adults. ISBN 978-88-470-5427-1. ↑ Lewandowski K, Lewandowski M (2006). "Epidemiology of ARDS". Minerva Anestesiol. 72 (6): 473–7. PMID 16682918. ↑ Goldman, Lee (2011). Goldman's Cecil Medicine (24th ed.). Philadelphia: Elsevier Saunders. p. 635. ISBN 1437727883. ↑ Vlaar AP, Binnekade JM, Prins D, et al. (2010). "Risk factors and outcome of transfusion-related acute lung injury in the critically ill: a nested case-control study". Crit Care Med. 38 (3): 771–8. doi:10.1097/CCM.0b013e3181cc4d4b. PMID 20035217. ↑ Moss M, Bucher B, Moore FA, Moore EE, Parsons PE (1996). "The role of chronic alcohol abuse in the development of acute respiratory distress syndrome in adults". JAMA. 275 (1): 50–4. doi:10.1001/jama.1996.03530250054027. ↑ Moss M, Guidot DM, Steinberg KP, et al. (2000). "Diabetic patients have a decreased incidence of acute respiratory distress syndrome". Crit Care Med. 28 (7): 2187–92. ↑ Koh GC, Vlaar AP, Hofstra JJ, et al. (2012). "In the critically ill patient, diabetes predicts mortality independent of statin therapy but is not associated with acute lung injury: A cohort study". Crit Care Med. 40 (6): 1835–1843. doi:10.1097/CCM.0b013e31824e1696. PMC 3379571 . PMID 22488007. ↑ The Acute Respiratory Distress Syndrome Network (May 2000). "Ventilation with lower tidal volumes as compared with traditional tidal volumes for acute lung injury and the acute respiratory distress syndrome". N Engl J Med. 342 (18): 1301–8. doi:10.1056/NEJM200005043421801. PMID 10793162. ↑ Wiedemann HP, Wheeler AP, Bernard GR, et al. (2006). "; National Heart, Lung, and Blood Institute Acute Respiratory Distress Syndrome (ARDS) Clinical Trials Network. Comparison of two fluid-management strategies in acute lung injury". N Engl J Med. 354 (24): 2564–2575. doi:10.1056/nejmoa062200. PMID 16714767. ↑ Wheeler AP, Bernard GR, Thompson BT, et al. (2006). "; National Heart, Lung, and Blood Institute Acute Respiratory Distress Syndrome (ARDS) Clinical Trials Network. Pulmonary-artery versus central venous catheter to guide treatment of acute lung injury". N Engl J Med. 354 (21): 2213–2224. doi:10.1056/nejmoa061895. PMID 16714768. ↑ Brun-Buisson C, Minelli C, Bertolini G, et al. (2004). "; ALIVE Study Group. Epidemiology and outcome of acute lung injury in European intensive care units. Results from the ALIVE study". Intensive Care Med. 30 (1): 51–61. doi:10.1007/s00134-003-2022-6. PMID 14569423. ↑ Ashbaugh D, Bigelow D, Petty T, Levine B (1967). "Acute respiratory distress in adults". Lancet. 2 (7511): 319–23. doi:10.1016/S0140-6736(67)90168-7. PMID 4143721. ↑ Ware L, Matthay M (2000). "The acute respiratory distress syndrome". N Engl J Med. 342 (18): 1334–49. doi:10.1056/NEJM200005043421806. PMID 10793167. Marino, Paul (2006). The ICU book. Baltimore: Williams & Wilkins. ISBN 978-0781748025. Martin GS, Moss M, Wheeler AP, Mealer M, Morris JA, Bernard GR (2005). "A randomized, controlled trial of furosemide with or without albumin in hypoproteinemic patients with acute lung injury". Crit. Care Med. 33 (8): 1681–7. doi:10.1097/01.CCM.0000171539.47006.02. PMID 16096441. Jackson WL, Shorr AF (2005). "Blood transfusion and the development of acute respiratory distress syndrome: more evidence that blood transfusion in the intensive care unit may not be benign". Crit. Care Med. 33 (6): 1420–1. doi:10.1097/01.CCM.0000167073.99222.50. PMID 15942365. Mortelliti MP, Manning HL (May 2002). "Acute respiratory distress syndrome". Am Fam Physician. 65 (9): 1823–30. PMID 12018805. Metnitz PG, Bartens C, Fischer M, Fridrich P, Steltzer H, Druml W (February 1999). "Antioxidant status in patients with acute respiratory distress syndrome". Intensive Care Med. 25 (2): 180–5. doi:10.1007/s001340050813. PMID 10193545.